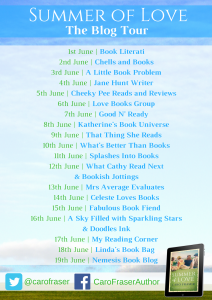 I’m so excited to share an extract from the novel by Caro Fraser as part of the book tour for Summer of Love, this is another beautifully written and charming tale from such a prolific and wonderful author. It doesn’t fail to meet up to expectations and if you have enjoyed her other books, you will certainly enjoy this one – and what perfect timing weather wise! Here is a sneaky extract to whet your appetite! Sonia told Avril and Laura about the move to London when they came home for the Easter holidays. ‘But what about Socks?’ asked Laura anxiously. The two girls were markedly different in looks. Avril, seventeen years old, had brown hair cut in a straight bob, and although not pretty in any conventional sense, her full mouth and sulky dark eyes gave her a certain compelling, intense attraction. Laura was slender, tall for her age, and delicately pretty, with unusual grey eyes, high cheekbones, and dark brows and lashes that contrasted with her blonde hair. Over the next few days, with Effie’s help, Sonia turned out all the rooms in the house, deciding what would be kept, what discarded, and what, if anything, put into storage. Wardrobes, drawers and cupboards were emptied, boxes filled, and labels stuck on furniture earmarked for the Mayfair flat. While Laura was busy sorting out nursery toys for the local orphanage, Sonia and Avril made a tour of the library to see which books should be kept. Together they walked down through the orchard to the barn. At the sight of it a kind of shutter seemed to slide back in Avril’s mind. Revealing… what? Not so much a memory as an unsettling feeling. She had no clear recollection of ever having been in it. When she was a child her father’s studio had been very much out of bounds, and since his death it had remained locked, a forbidding place she had no wish to visit. The barn door had become swollen with the damp of a dozen winters, and they had to push hard to get it open. Mother and daughter stepped inside. A faint scent of turpentine hung in the air, strangely evocative. Paint-splashed trestle tables stood beneath the window, and the floor was littered with tubes of paint and unswept shards of broken jars. A few canvases were stacked against one wall, and in the middle of the studio stood a wicker chair. The light that slanted through the big windows, once full and bright, was dappled now with shadows from the bushes and young trees that had grown up outside. A pigeon flapped from a high beam with a whirring clatter of wings, startling them, and circled the space in the hayloft. ‘There must be some broken slates up there,’ murmured Sonia. Avril bent down and picked up some tubes of paint from the floor, and put them on a table. She walked over to the big ladder leading up to the hayloft, and stared up into the darkness. Again she experienced that sense of some shadow in her mind. Something frightening, elusive. She walked over to the canvases stacked against the wall and began to turn them over. They were mostly blank and untouched, though a couple were daubed with sketchy, preparatory brushstrokes. The last she turned over was a portrait, complete and perfect, of Madeleine, her old nanny, sitting on a wicker chair in a yellow sundress, head half-turned in a listening attitude. Avril stared at it, wondering why the picture seemed to strike some strange chord of recollection. Avril studied the painting with detachment. She was already developing a good eye, and she knew that this portrait, among the many of her father’s that she had seen, possessed a special quality. Sonia found a piece of canvas to wrap the painting in, and then, once she and Avril had searched the studio and satisfied themselves there was nothing else of interest or value, they went back to the house.